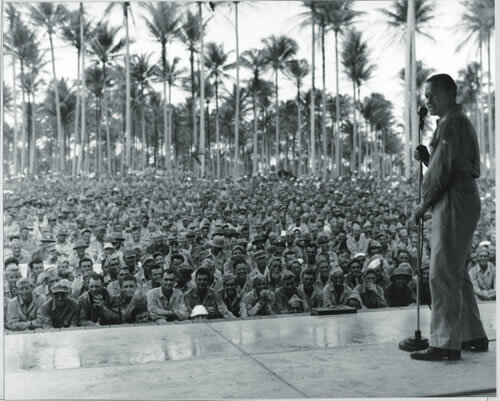 There was nowhere Bob Hope wouldn’t go to entertain the best audience he ever had—America’s WWII service men and women. Hope’s five-decade career “covering the bases,” as his biographer William Faith describes it—some 60 tours from Korea to Vietnam to the Persian Gulf—began almost by accident. We weren’t even at war then. It was early May 1941 when his radio producer, Albert Capstaff, urged him to take The Pepsodent Show out of its Hollywood studio and do a live broadcast from March Field in nearby Riverside. Hope didn’t see the point. Why not just bring the soldiers to the studio? Capstaff told him they numbered in the thousands. He didn’t mention his ulterior motive: his own brother was one of the soldiers. 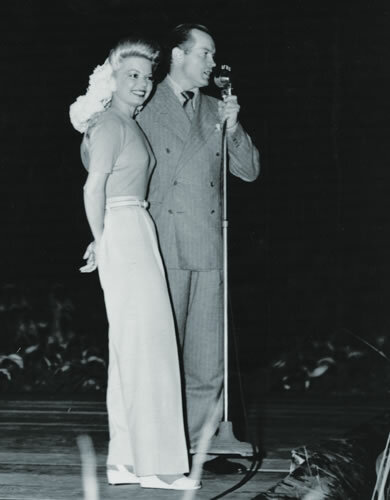 In the end, a group that included Hope’s mustachioed sidekick Jerry Colonna, announcer Bill Goodwin, and singer Frances Langford, who recently had replaced Judy Garland on the show, made the trip to March Field. The following week, the Pepsodent bunch was back in the studio after the trip to March Field, but when the impact of that first camp show became obvious, Hope and company began traveling around California in subsequent weeks to visit sailors at the San Diego Naval Station, marines at Camp Roberts north of Paso Robles, and soldiers at Camp Callan in La Jolla. By that time Caught in the Draft had become the most popular Paramount film of 1941. The pattern was set. 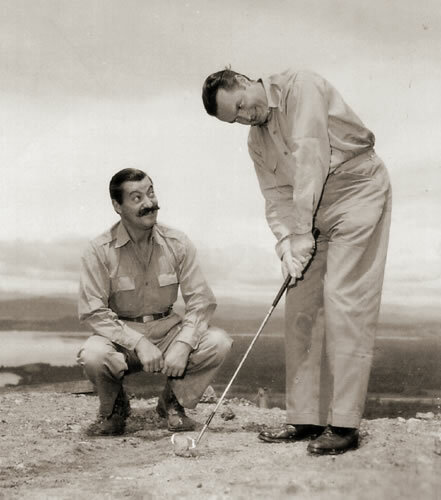 A poll published two days before Christmas 1941 in Radio Daily, the newspaper for commercial radio and television stations, confirmed the national appeal of the military broadcasts by naming Hope the top comedian and top entertainer of the year. Such honors didn’t mean much, however, coming in the somber weeks after the Japanese surprise attack on Pearl Harbor. Quirk wrote that Hope was irked on Sunday morning, December 7, because This Week magazine, a supplement to the Sunday edition of the Los Angeles Times, had reported his gross income for 1940 ($464,161.78). But the startling news coming over the radio from Hawaii quickly made him forget his irritation. 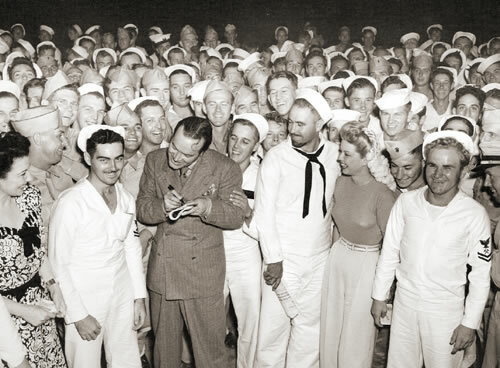 In the spring of 1942, Hope became master of ceremonies for the Hollywood Victory Caravan, a two-week tour of 12 American cities that was part of a film industry effort that ultimately raised a billion dollars for army and navy relief agencies. 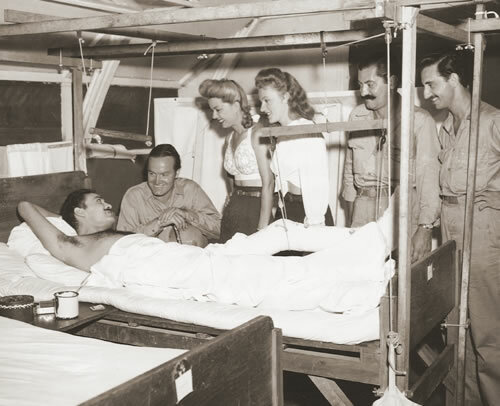 The caravan included 50 Hollywood stars, among them James Cagney, Bing Crosby, Olivia de Havilland, Cary Grant, Laurel and Hardy, Groucho Marx, Merle Oberon, and Spencer Tracy. They did skits written by big-name writers George S. Kaufman and Moss Hart and performed songs by popular composers Jerome Kern, Johnny Mercer, and Frank Loesser. Hope made a cameo appearance in the one-hour 1943 training film Welcome to Britain, starring Meredith, which tried to explain the English people and their customs to newly arriving American GIs. (In the words of one reviewer, the documentary shows that “British coffee is awful, their beer is warm, they have a fetish about tea.”) Hope shows up in a scene with a taxi driver, discussing the English monetary system of pounds and shillings. The following summer, 1944, the Gypsies were off again, logging more than 30,000 miles in the South Pacific, giving more than 150 performances on remote backwater islands, places like Eniwetok, Tarawa, Kwajalein, Saipan, and Majuro. Hope called it “Loew’s Malaria Circuit” or “the Pineapple Circuit.” At one show, the troupe found out that a Japanese soldier had been killed a few hundred yards from the stage. Steinbeck, who had won the Pulitzer Prize in 1939 for The Grapes of Wrath and would win the 1962 Nobel Prize in Literature, spent the second half of 1943 as a war correspondent for the New York Herald Tribune. He wrote a column published on July 26, 1943, that was probably the finest review Hope ever got for his wartime work. Richard Sassaman lives in Bar Harbor, Maine. He has written for America in WWII about the atomic bomb, Bataan, Corregidor, the Doolittle Raid, and Nazi spies who in November 1944 visited what is now his neighborhood.